It's more than just a port city or the 2002 FIFA World Cup final match - Yokohama is the second largest city in Japan by population (only surpassed by Tokyo, of course) and the capital city of Kanagawa Prefecture. Known as a historic downtown port district, Yokohama was home to one of the first foreign settlements in Japan and is now home to the largest Chinatown in Japan - also one of the largest in the world. Downtime in Yokohama can be spent shopping in the Motomachi shopping district, visiting bars at Noge, or viewing the 19th to early 20th century foreigners' mansions at Yamate, formerly known as The Bluff. Visitors can also spend a day walking around the Minato Mirai area, make their own Cup Noodles at the Cup Noodle Museum, or get a bird's view of Yokohama from the top of the Cosmo Clock 21 ferris wheel. Looking to shop til you drop and eat some good food? You'll want to head over to Landmark Tower (once the tallest building in Japan! ), the Red Brick Warehouse, Marine & Walk mall, or Queen's Square mall. From wide sidewalks to lush parks and prime waterfront areas, you'll find plenty of space to run in Yokohama. Just time your runs wisely; the sidewalks can be congested with pedestrians, pets, and children, particularly in the evenings and on weekends. Shin Yokohama Park (also, Shin Yoko Park)is not just any park - it's a park designed to accommodate runners! Running is easy here with a 5KM, 2.2KM, 1.8KM, and 940 meter course all sorted out for you - distances are clearly written on the blue runner's lane. Even if it's raining, you can do loops under the cover of the Nissan Stadium - each loop is 940 meters. "Rest houses" with changing rooms, showers, and coin lockers are located on the northeast side of the stadium and by the stretching area on the 1.8KM course. It's unclear if the XSPOT (Cross Spot) remains open, but they offer a variety of items for rent (for free), including shoes, Garmins, and sporting goods (tennis rackets, yoga mats, soccer balls, baseball mitts, etc.). 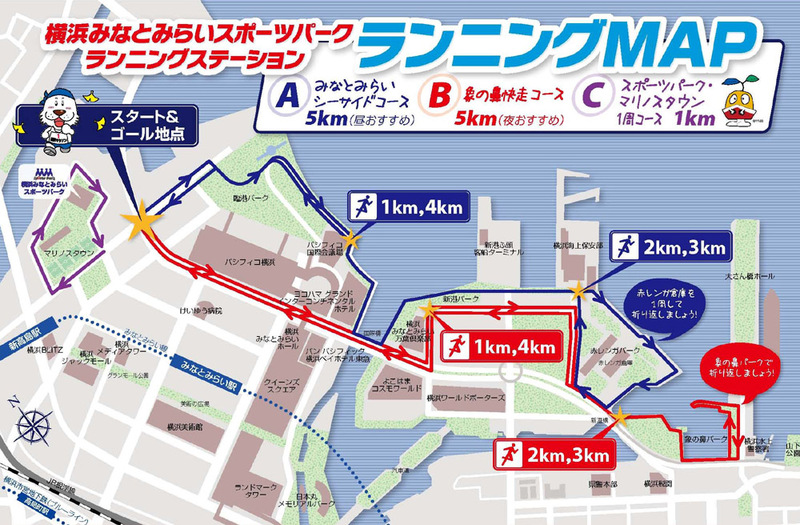 If you were to ask about running spots in Yokohama, the Minato Mirai area is always going to come up. It isn't a particularly big area but running in this part of town will give you great views of Rinkai Park, the Red Brick Warehouse, and Yamashita Park. If you're coming from afar, The Space and the Sports Park are easily accessible and useful for those running around Minato Mirai. The Space has 5KM, 6KM, and 10KM running courses mapped out here. Similarly, the Sports Park has a simple map featuring two 5KM courses and a 1KM course here (the same map is featured below with landmarks in English). Night or day, solo or in a group, Minato Mirai offers some of the best grounds for a run. Keep in mind that its location by the sea means that the winds can be strong (and cold). One of Yokohama's largest parks, a loop around the Negishi Shinrin Koen (Negishi Forest Park) is 1.3KM - and it's not all flat! If you're looking for some hills, this is a great enclosed space for runners. Coin lockers and showers are available on-site. The park is a quiet, relaxing place away from the hustle of the city. During the spring, cherry blossoms bloom and the park becomes busy with those reveling in the warmer temperatures. Whether it's the fall foliage or a dusting of snow, you'll be reminded of nature's beauty every time you run through the park. Take the JR Negishi Line to Negishi station or Yamate station; then walk about 1KM (15 to 20 minutes) to the park. Umi no Koen (Marine Park) is home to the only beach in Yokohama city where you can swim. The running course around the park is marked every 200 meters for a total of 2200 meters. During the summer, you'll find visitors sunbathing, swimming, or even gathering shellfish (primarily for consumption and only up to 2KG per person). The Marine Park also boasts a multipurpose field and a barbeque area (BYOB). Take the Seaside Line to Umi no Koen Minamiguchi station, then walk about 5 minutes (400 meters) to the park. Geared towards runners and cyclists. Has sports apparel, running shoes, sunglasses, and fitness watches available for rent - the first item is always free, subsequent items require a small fee. Has sports apparel, running shoes, and towels for rent. Running lab lets runners check their running form and receive a gait and foot analysis. Primarily a soccer practice facility, the Sports Park also has soccer fields and a futsal court.